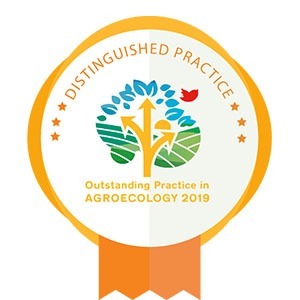 The African Biodiversity Network has been recognised as an Outstanding Practice in Agroecology 2019. See press release below. The recognition highlights outstanding practices advancing the transition towards agroecology from the global South. Out of 77 nominations from 44 countries, 15 receive recognitions, including practices from across Africa, Asia, and Latin America. This NGO project works in 11 African countries to revive traditional agroecological farming systems, promoting seed and food sovereignty and regenerating livelihoods. Currently, it has 4,640 farmers working on reviving seeds and has revived 470 varieties of seeds. Premium Hortus specialises in the e-commerce of agroecological products, organic production, and producer support. So far, the African Greentech company has trained 400 small farmers and provided access for more than 700 urban households to healthy food. Waste is also limited and recycled. The research project enables farmers to implement agroforestry techniques and to diversify livelihoods, learned at inclusive Rural Resource Centres (RRC). In Cameroon, it opened with communities 10 RRCs, hosting 150 nurseries and serving over 10,000 households, planting 1.6 million trees. The research programme increases the capacity for self-regulation of pests. From 2003-2008, 30,780 farmers were trained and diffused APM to others. This has led to reduced costs of pesticides and pests in 75% of Cuban agrarian production and an increase of biodiversity and climate resilience. Today SEKEM is a leading social business worldwide. It reclaimed about 684 hectares of desert land, of which 100% is operated by biodynamic agriculture methods. More than 70% of SEKEM’s reclaimed land produces food and raw materials for the local market. Its products respect the highest possible ethical, ecological and social standards. Based on individual and collective investment, risk sharing and consultation and negotiation, this practice facilitates a transition to boost agroecology, strengthens local institutions for self-determination, facilitates a higher level of aggregation and diversifies production and markets. By 2018, 180 smallholders have been trained in agroecology. The practice improves rural development by focusing on organic production, social entrepreneurship, and marketing hubs. It has trained 3,048 smallholders on climate-resilient agriculture and initiated 22 farmer’s organizations now engaging in social entrepreneurship. Working directly with local farmers in Zimbabwe, the ACHM disseminates holistic management planned to graze. This has multiple proven benefits for soil regeneration and for farmers’ revenues. The Centre has trained 100 facilitators so far and reached 15,000 communal farmers in 16 Zimbabwean communities.